Every organization, every team, needs (and wants) great leaders. Leadership isn’t just for executive, C-suite positions. Leadership must occur at every level of an organization. It is the responsibility of leaders to effect change and bring their teams towards results. There are many different ways to define leadership — depending on who you ask, what their personality style is, and what their experience of leadership has been in the past. You are likely to get as many different definitions as the number of people you consult. This idea, that leadership is so hard to define and nail down, set me on a mission to better define leadership and the characteristics, roles and responsibilities of an effective leader in a way that could be put into action by all businesses — regardless of size. As you can see, there is no singular “right” definition of leadership, which makes it all the more important for leaders in all capacities to define leadership for themselves, and discover their unique strengths. One of my favorite tools for identifying and reflecting on our own leadership strengths and tendencies is Everything DiSC ® Work of Leaders. This program utilizes the framework of Vision, Alignment, and Execution to help leaders to reflect and engage in dialogue so they can better understand their personal leadership style and the impact of their actions. Everything DiSC ® Work of Leaders is both personalized and direct, and it gives easy-to-apply, relevant tips for taking action. As defined by Everything DiSC ®, there are just three overarching steps that are core to the work of leaders. Through these three steps, leaders create a profound sense of self-awareness to help them grow and flourish as leaders, as well as lead their teams to extraordinary results. This program is the direct result of a four-year development that focused on synthesizing and analyzing leadership best practices from over 300 subject matter experts from 150 organizations. 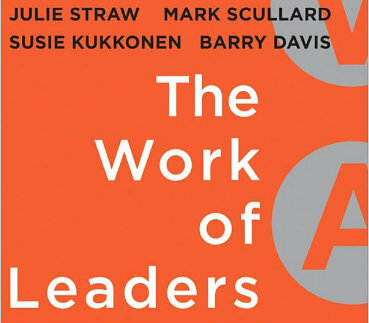 To learn more, read The Work of Leaders: How Vision, Alignment and Execution Will Change the Way You Lead by Straw, Scullard, Kukkonen and Davis. Work of Leaders takes your Everything DiSC ® style and identifies how it impacts your approach to each of the three steps: Vision, Alignment and Execution. It also provides feedback on where you naturally tend to fall on 18 leadership best practices. Every organization and leader has a vision – some are just clearer than others. As a leader, how well you are able not only to craft, but also to communicate and reiterate your vision, will directly impact the buy-in and motivation of your team. In this step, you will learn how to craft a meaningful vision for the future through exploration, boldness and testing assumptions. How do you get everyone on board? How do you ensure everyone is moving in the right direction? Just creating a vision and telling it to your team isn’t enough. How do you make your vision a reality? You could hope and wish and pray, but that won’t do the trick! Leaders must champion execution through a focus on momentum, structure and feedback. Everything DiSC Work of Leaders ® is appropriate for all leaders at all levels, and it especially well-suited for C-level leadership teams . Do you want to help your leadership team achieve even better results? Or maybe you’d like to develop those leaders within your organization who have the potential to take on leadership roles? Download a sample Everything DiSC ® Work of Leaders profile. I’ve seen the results of Everything DiSC ® Work of Leaders. It has successfully provided teams with the language, concepts, tools and steps that help emerging leaders flourish and experienced leaders become even more effective. Ask me how you can get started. I’m here to help! What defines leadership? We continue our discussion with the product Everything DiSC ® Work of Leaders. Here, you will gain insight on how to find and create effective leaders with three simple steps.